A tattoo is a beautiful piece of art which stays inked on your skin forever, so it’s imperative that you choose something which you really love to ensure that you never tire of this permanent mark. Tattoos can be commemorative or simple quotes or phrases, pictures or patterns which you enjoy. Here are some gorgeous tattoo ideas for women, to provide you with a little inspiration for your tattoo! We’re starting with an emotional tattoo design which celebrates the life of someone special. Reading ‘she lived and laughed, and loved and left.’ and then the years of someone’s life and death. 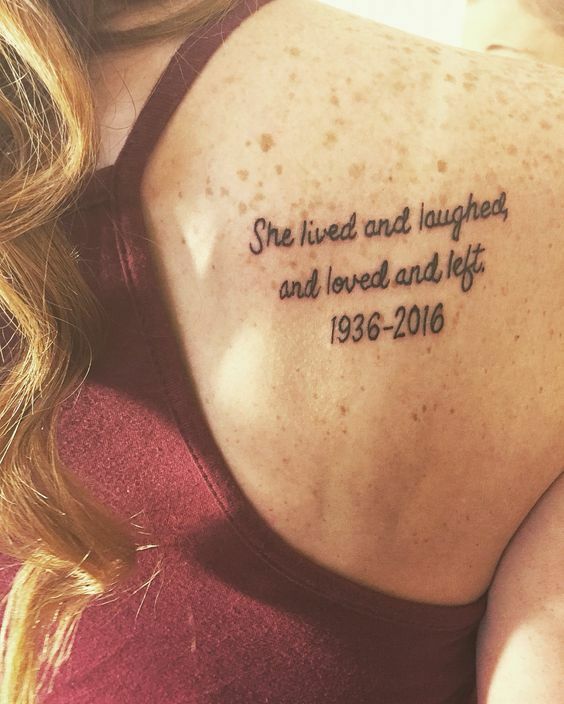 The quote is happy, celebrating the beautiful things about the life of this lady, and is a gorgeous and touching tribute to someone who meant so much. Pictured above is a beautiful and delicate wrist tattoo which outlines the finer things in life. 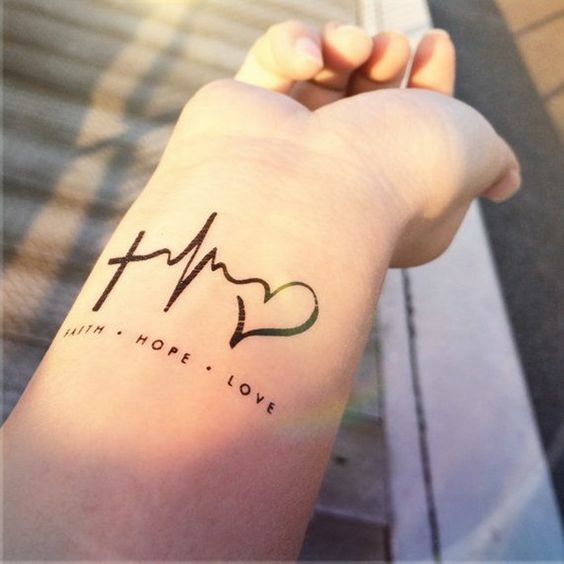 Faith, hope and love are what makes this lady’s heart beat, which shows through this beautiful little symbol, linking the icons for faith, hope and love in one unique picture. A perfect tattoo design for someone who wants some ink which is delicate, subtle and oh so feminine. This lady has opted for a beautiful little floral design, placed behind the ear for a beautiful and intricate art work which we just cannot get enough of! 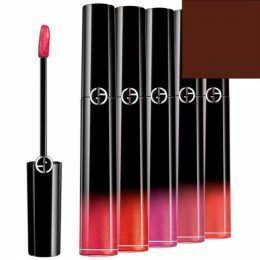 We absolutely adore this look. This is a beautiful quote which rings true for so many of us, and that’s exactly why we’ve included this in our tattoo inspiration gallery. 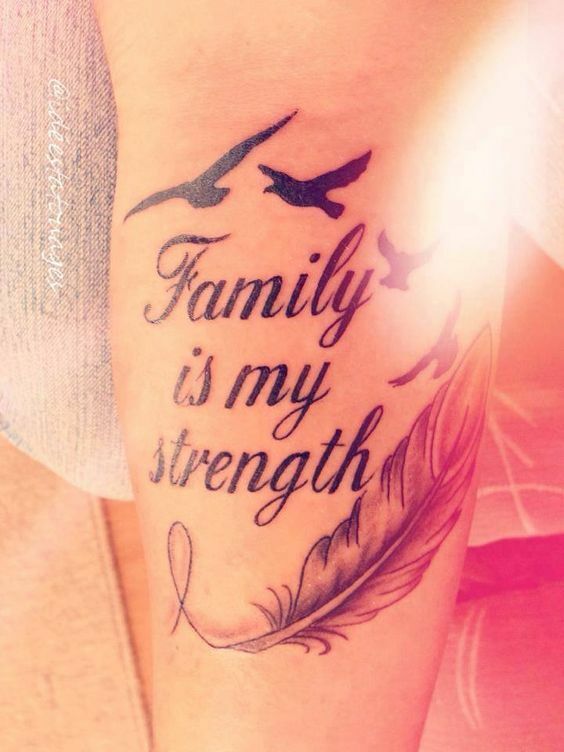 Reading ‘family is my strength’ with a stunning picture of a feather drawn underneath and some birds above the quote, this tattoo is the perfect tribute to your nearest and dearest and very touching indeed. 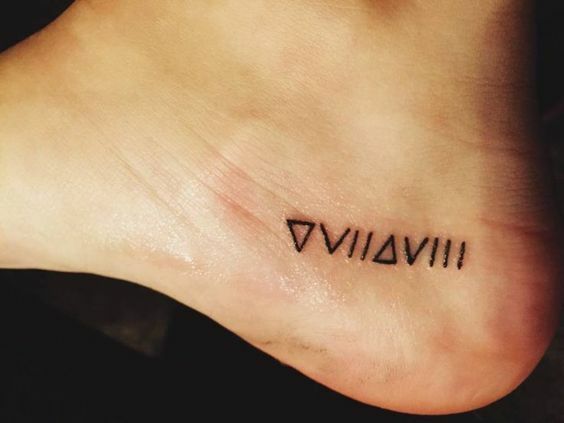 This unique and dainty ankle tattoo comprises of several different symbols, which when together, translates to ‘fall down seven times, stand up eight’. This means that no matter what life throws at you, you will always get through it, and we think that this is an incredible message which is just perfect for the foundation of a tattoo. A heart tattoo is somewhat a classic for female tattoo ideas, and this beautiful little heart icon inked on this lady’s wrist proves exactly why that is. 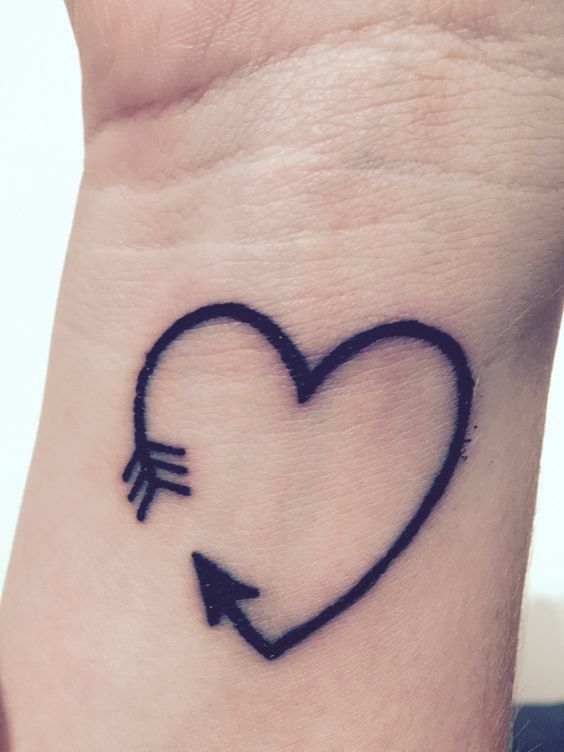 This stunning heart outline is an arrow which forms the shape of the heart, creating a tattoo which is simple but effective, and super cute too! 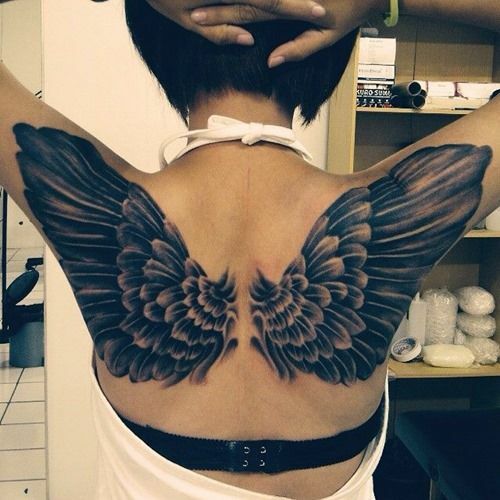 Wings symbolise angels, which is why they’re such a popular image in the world of tattoos. Angels are those who watch over us or those who are in heaven, or people who simply do so much for us. Opting for an angel wings tattoo can be tribute to a loved one who has passed on, or just beautiful imagery as pictured above. We adore this tattoo! 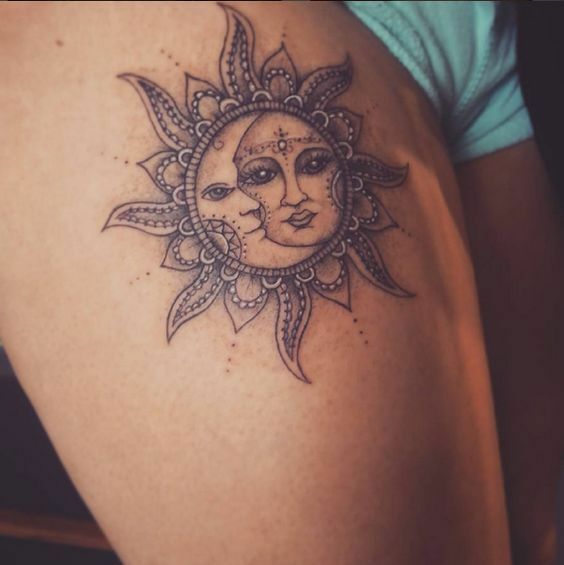 Sun and moon imagery is rife in a variety of different cultures and heritages, and this stunning tattoo consisting of a sun and a moon together is beautifully designed. Placed on this lady’s upper thigh, this intricate inking is of the sun with the moon’s face inside. The Styles Weekly office think that this tattoo is just gorgeous! 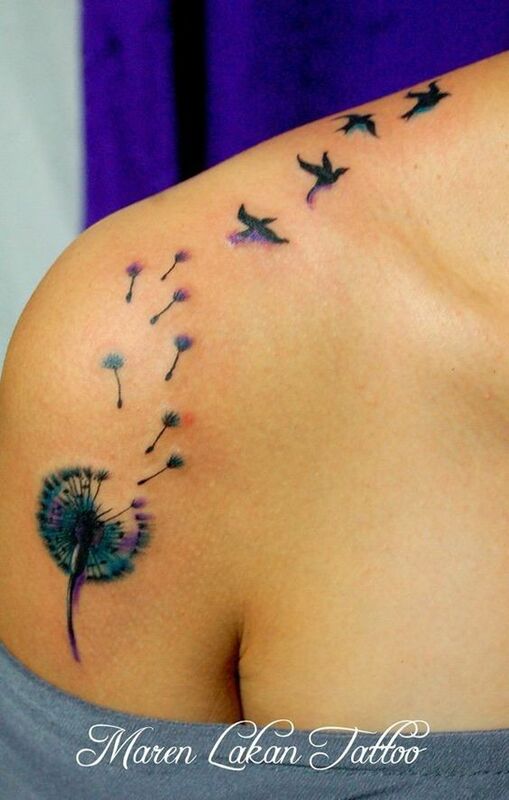 Colourful and intricate, this dandelion and swallow tattoo is truly stunning. Starting with a dandelion just below the shoulder, this design features black, lilac and turquoise colours and shows little pieces of the dandelion blowing off, which gradually turn into swallows flying away. Symbolic and beautiful! 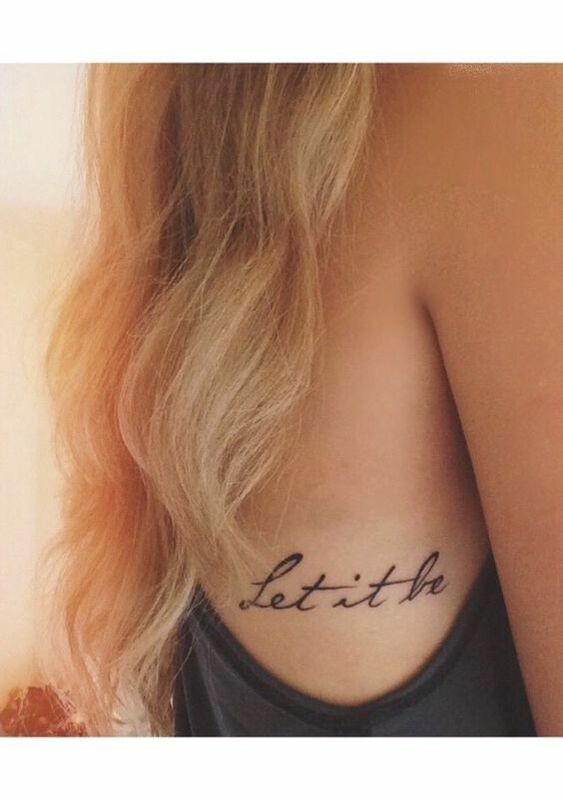 “Let it be” reads the quote on this lovely lady’s ribs, and we think it makes a truly stunning tattoo idea – don’t you? This italic and striking text is oh so beautiful, and the title of the famous Beatles track works just perfectly here. It’s a lovely and peaceful message and we think that next to this lady’s gorgeous flowing locks it is absolutely wonderful. 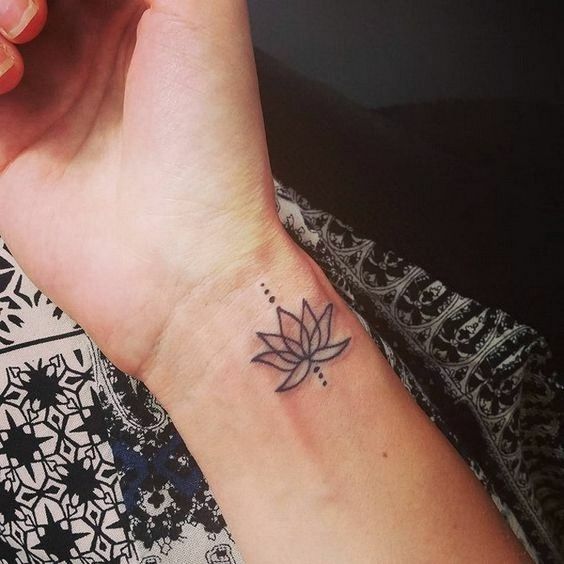 Lotus flowers symbolise purity and harmony, which is exactly why they’re such a popular choice for tattoos on both men and women! This lovely lady has opted for a stunning swirling outline of a lotus flower on her wrist, finished with dot details on top and underneath the flower. 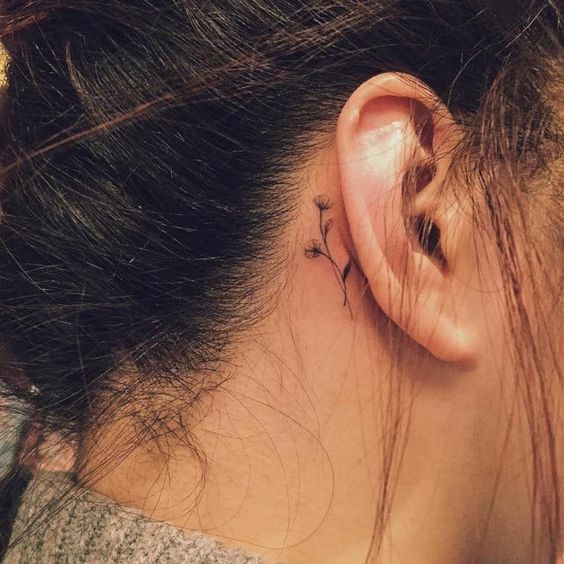 We adore this little tattoo! This gallery is full to the brim of beautiful tattoo ideas and inspiration for women – from quotes to pictures, lyrics to symbols. No matter which type of tattoo you’re looking for, the Styles Weekly team hopes we’ve been able to help. 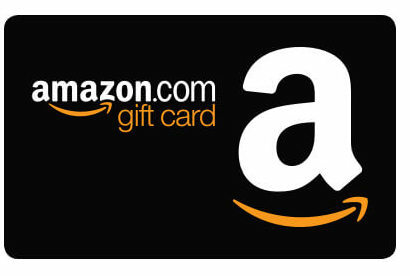 Let us know what you’d like to see next in the comments. 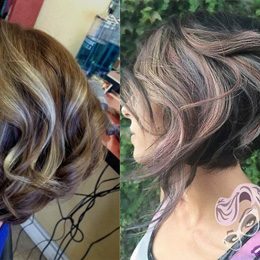 Do you love these tattoos for women? 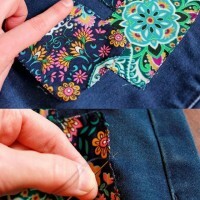 And here are more cute small tattoo ideas for women.